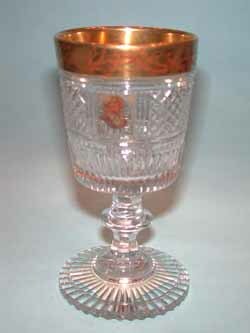 A 'Blackjack' 1646 Tumbler showing the engraving. Photographs entered for registation of the Design by Phillips of Oxford Street. The shape only was regisisterd. More information on Stuart Medallion Cameo via the link at the top of the page. cut with a Fuchsia and butterfly, repousse silver hinged cover opening to reveal internal glass stopper, circa 1887, 3in (7.5cm) approx. decorated with etched prunus and 'mons', probably Stevens and Williams, 12in (30.5cm) high approx. the cameo of white cut through to pink with an unusual view of sail boats in a rough sea, on a brilliant cut ground, marked PATENT, circa 1888, 5in (12.5cm) wide. Click on DETAILS link at the top of the page for a close up photograph of the cameo medallion cutting. designed by Dr Christopher Dresser, late 19th Century, 4in high approx. by 41/2in wide at base. The base has the James Couper etched mark 'designed by Dr. C. Dresser. A photograph of the mark can be found on the DETAILS page (link at the top of the page. 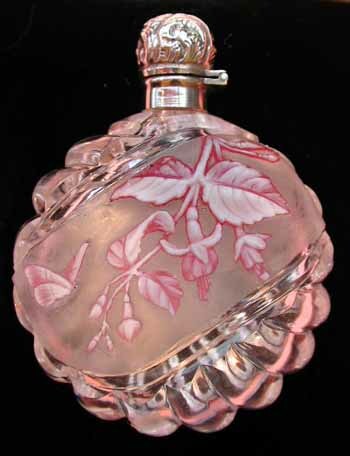 Many pieces of glass are 'attributed' to Dr Dresser but very few are marked as being designed by him. 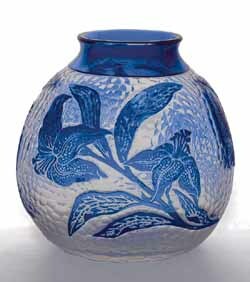 the blue cameo cut through to clear with lilies on a planished ground, acid cut mark to base. Part of our selling exhibition 'Fragile Flowers' click on Exhibtion to commence veiwing. comprising shaker and five harlequin glasses, etched and enamelled with spiders, webs and butterflies, white metal mounts, acid stamped factory marks and orginal paper label, circa 1935, 8 1/2in (22cm). Click on DETAILS at the top of this page for other photographs of this set. the bodies printed with figures in Victorian dress forming letters spelling Gin and Rum, the bases marked Richardson's, topped by fine silver gilt stoppers hallmarked for Robert Garrard, London, 1835. 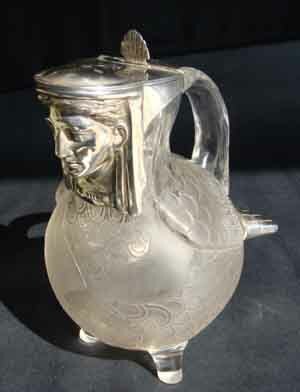 A detail from the 'Rum' Richardson's decanter. The 'Gin' example is illustrated in Hajdamach 'British Glass' 1800-1914, pg 104, Col.pl 10.
enamelled with devils in various poses in black and red, acid stamped factory marks, 1930's, decanter 9in (23cm) high approx. Etched mark on the Stuart 'Devil' decanter. made expressly for RMS Queen Mary of the Cunard Line, 1930's. 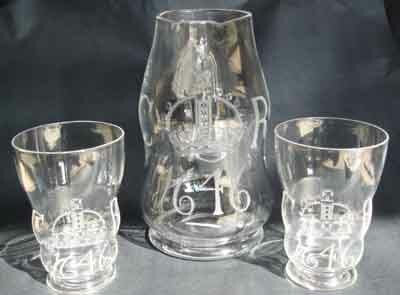 Etched RMS Queen Mary mark to each of the Stuart Crystal Cocktail Glasses Set. Gold Stuart Crystal and Cunard Steamship Company mark to fitted box. English, c.1875, 8 3/4in (22cm) high approx. For more wine glasses click on 'Drinking Glasses' button. very well engraved with a scene of a fox hunt, circa 1880, 19cm high.